Last week I shared the quilt were calling Unchained Melody that I made for Jason’s sister Megan as a Christmas gift–And I promised you a tutorial! Mom showed you it on the frame. Now I’m showing it to you completely bound just before it was wrapped. Well here it is my friends! Usually when I make quilts, I don’t lay anything out before sewing the top together. When I then go through and iron out the top, it is kind of interesting (to me anyway) to see how things come together. Usually, it is pretty neat to see fabrics together that I may have not intentionally placed near each other. 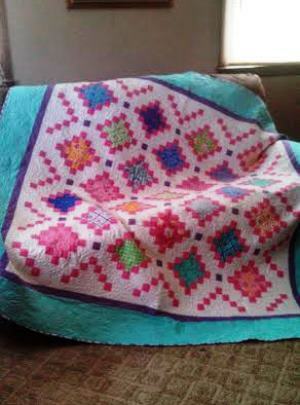 This quilt, however is best when laid out–Trust me on that as I learned the hard way. After just a bit of quality time with my favorite unsewing tool (read as seamripper), I had everything fixed and ready to go. When I made this quilt, I also added Jason’s sister’s name to the quilt. Megan has severe autism and lives in a home about an hour from here and has previously had issues with her things staying with her. Apparently they can grow legs and just walk away. 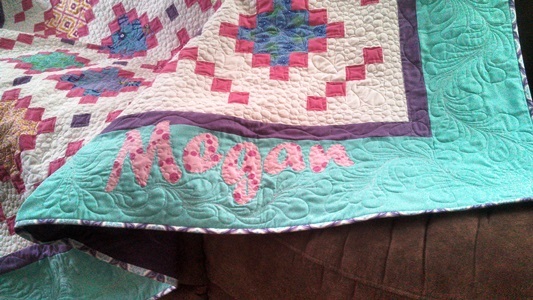 By adding her name to it, I am pretty sure that this quilt will stick around! To add her name, I just added Steam a Seam to a remaining layer cake square, found a font that I liked in Microsoft Word, printed out her name, traced the letters onto the layer cake square (backwards), cut them out and ironed them on. One of my favorite features of this particular quilt is the quilting. 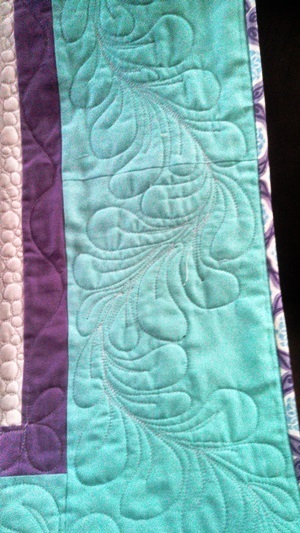 I haven’t really taken to the intricacies of quilting like mom has, but boy am I glad that she has. She seems to think that she needs to work on things, but if you ask me, it’s great! As you can see, she definitely took some time to make this one special. I know that I sure appreciate it! 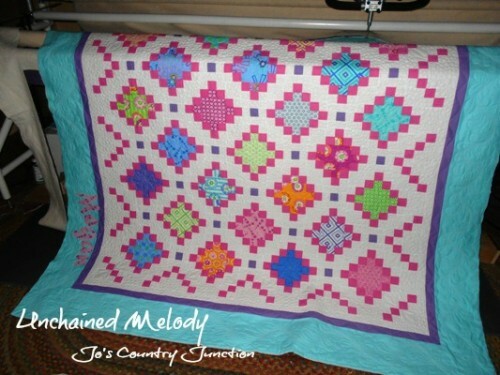 Here are the instruction to the Unchained Melody Quilt. You will need to have an Adobe Reader program to access the pattern. If you don’t have that, here is a link to the free program. 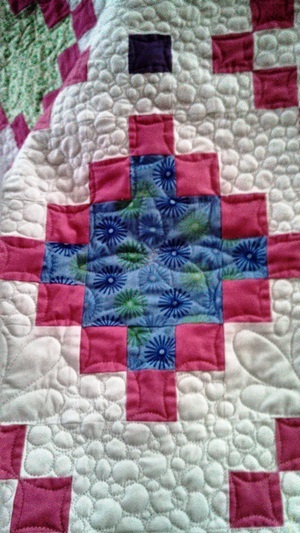 If you make the quilt, send us a photo, we’d love to see it and feature it here on the blog.